A note left on the table: “I’m going to the mountain. “ That night my mother took me, still a little girl, and we climbed the mountain. I set off on a journey through my memories of “mother.” Rope bridges, tunnels, decrepit old cable cars. A woman wanders mountain roads in the dead of winter, in clothes unsuited to hiking. The second work made using the same soundtrack, the same recited text, as “Salome’s Daughter: Another Side (First Fruits)”. This time the center of gravity is shifted to the narrative, and the relationships between the mother, daughter and absent father are explored. But what are “mother,” “daughter,” and “father”? These labels of self endlessly waver in the spaces between the polyphonic monologues and the multiple layers of image and sound. Loss of the family is shown in silhouette. A dance using stage equipment is projected on a scrim. Images presented in silence in the previous work are fleshed out with synchronized sound, and the mysterious group Wangel are now in a talkie . This might be a dream that orphans saw when they were dancing. 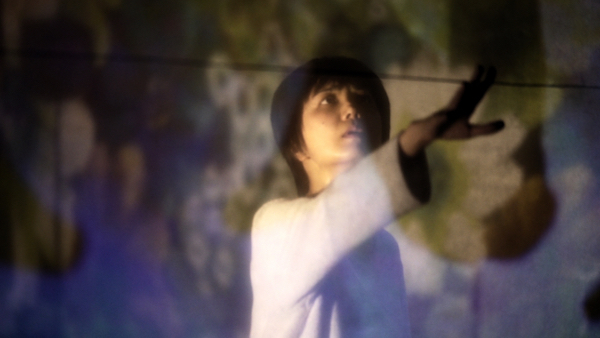 Prior to the screening, scrims and multilayered projection were employed in a performance featuring expression through the human body , enacted between the layers. © 2019 Kei Shichiri . All Rights Reserved.